Over the weekend I caught my first fish ever using a fly – I’m hooked (see what I did there?). Not only was it my first fish but I caught it using a relatively unknown style of fly fishing called Tenkara. The possibilities this unique style of fly fishing present have me even more excited than hooking my first fish. I’ve always wanted to learn how to fly fish. I spend so much time hiking along rivers, streams and lakes that it seems like I should be interacting with the water rather than just trying to get over or around it. But, traditional, western fly fishing has always seemed like a hassle. You need to carry so much gear – a whole mess of flies, several different lines, rod and reel at the minimum. It also takes a while to set up. You need to put the rod together, figure out what fly to use, test cast a few times, change flies and then finally hope to catch some fish. If I’ve got 30 minutes at lunch I don’t have enough time to go through that process. Not to mention that learning to cast and how to present your fly to a fish is a challenging thing to master. Enter Tenkara. This very minimalist style of fly fishing, which originated in Japan, has been blowing up in the outdoor community lately. I won’t get too much into Tenkara techniques and its nuances, since I’m no expert, but what I will get into is what my first experiences Tenkara fishing have been like and why I think EVERYONE who is hiking near water should consider taking up the sport. First off there is the obvious questions – what is Tenkara and why did I chose to begin my fishing career with it rather than the traditional western style fly fishing. Tenkara appealed to me because of its simplicity, quick setup, and easy learning curve. The main difference between Tenkara and western fly fishing stems from the fact that Tenkara uses telescoping rod and a fixed length of line that is attached to it’s tip. There is no reel. This allows for a couple things – the first is that casting (arguably the most difficult skill in fly fishing to learn) can be figured out in about 10 minutes. Its a very intuitive motion that, after watching a few YouTube videos, easily becomes second nature. The second benefit of the no reel setup is that you dramatically reduce the weight of your kit. Everything I need to go Tenkara fishing weighs a total of 4.9 oz. The third benefit is the quick setup time. I can go from having everything packed in my bag to having a line in the water in (seriously not exaggerating here) under 60 seconds. You grab your rod, pull out your line (which already has a fly tied to the end), attach the line and start fishing. This means I can take a 30 minute lunch break and spend 15 minutes eating and another 15 minutes fishing without falling behind on my hiking schedule. You can even stop for a quick 10 minute break on the trail and toss your line in the water for a few casts – try that with a western fly setup. This isn’t to say that there aren’t any drawbacks to Tenkara fishing. The main limitation is the size of fish you can catch. Tenkara is primarily aimed at going after small trout – think the 6 – 10 inch variety you find in mountain streams. You can pull in a 14 or 16 inch trout no problem but don’t expect to land a steelhead. So… what was it like?! It was awesome – that’s how it was like! To be fair, the experience was improved immensely by the fact that Tim Harris – blogger at http://northwest-tenkara.com and Tenkara extraordinaire – took me out and showed me the ropes. Within a few minutes I had the knack of casting and after about 15 minutes I had my first bite. I’m terrible so I didn’t get the hook set and lost the fish but it gave me hope that I could actually do this. After about an hour and several more near misses I finally landed this delightful 6 inch trout. This might not sound that impressive but know this, I am a TERRIBLE fisherman. I’ve tried to learn western fly fishing multiple times – I own a rod/reel and have a close friend who’s a pro and he’s given up on trying to teach me. I’ve also tried to spin for lake trout and salmon and been pretty much skunked on every outing while everyone else is hauling in the catch of their life. The first fish caught on my Tenkara Rod! I didn’t want to buy (or pack up a mountain) several different sized rods so the zoom feature really appealed to me. Its an “average” length rod which will allow you to comfortably fish the majority of streams you come across. It got great reviews from a couple different blogs run by experienced angles (http://northwest-tenkara.com/sato-review/ and http://www.tenkaratalk.com/2013/12/new-sato-rhodo-rods-from-tenkara-usa/). Its very light weight (even for Tenkara rods) – 2.6 oz. Tenkara USA has the best customer service in the business. If anything at all happens to your rod (even if its your fault) they will replace the broken section no questions asked. 2. When you are learning to cast use a furled Tenkara line rather than a level line. A furled line is made of two strands of material twisted together. 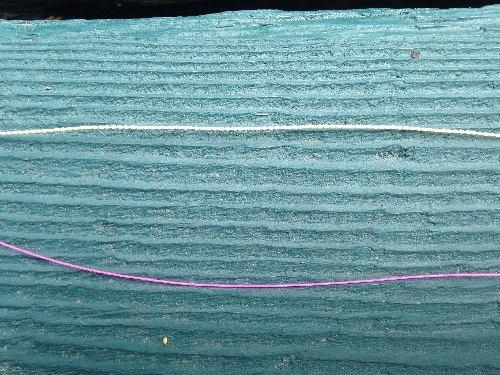 Level line is a single strand of plastic line. I’m no expert on what makes the furled line easier to cast with but whatever the reason its the way to go. The benefit of level line is that you can cut it to any length you want rather than the fixed length of the furled line. Once you get better at casting you will probably use a furled line for general fishing and then a level line to hit those long distance honey holes. The furled line is on top and the level line (pink) is on the bottom. 3. Tenkara anglers will recommend “reverse hackle” flies which are different than traditional western fiys. Don’t get hung up on this. Regular flys work just fine too. You won’t be good enough in your techniques at the start for this to matter. When you are trying to figure out what flys to use go to your local fly shop and ask for the top 3 dry flys they recommend for your local rivers. Most of the time you will be using a 12, 14 or 16 size fly. 4. A lot of people (myself included) were curious as to how you land a fish without having a reel. Its pretty simple. Your line is really not that long (maybe on average 15 feet in length total) so all you need to do is point your rod toward the sky and grab the line. The fish aren’t that big so hand lining isn’t a struggle. 5. Its also important to note that Tenkara is not simply dapping. 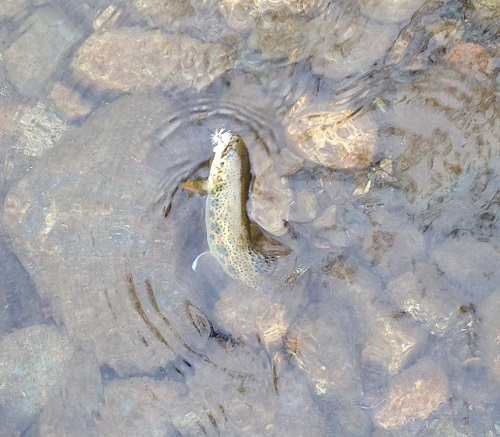 Many western fly anglers assume Tenkara equals dapping and write off the entire approach. Dapping, just like western fly fishing, is one technique you can use but it is not the only technique. The majority of the time you will be casting. 6. Its pretty cheap hobby to get started with. I spent $264.85 on the Sato starter kit and $7.55 on a spool of tippet direct from Tenkara USA’s website. Outside of that I spent another $16 on a specialty furled line that Tim recommended from Moonlit Fly Fishing (http://moonlitflyfishing.com/shogun-tenkara-line/) and about $30 on flys. I don’t anticipate buying much else other than replacement flys. So there you have it – my Tenkara experience. I’m a huge fan and very excited to become a better fisherman. Step one is referring to myself as an “angler”, I hear that’s what they pro’s say. If you want to find out more about Tenkara I really recommend going to Tenkara USA’s website. They have a ton of advice to help you master Tenkara techniques as well as some nice blog entries to take you deeper into the nuances of Tenkara. This entry was posted in Activities, Activities, Alpine Mountineering, Articles, Activities, Backpacking, Activities, Car Camping, Activities, Fishing, Activities, Hiking, Brands, Tenkara USA, Activities, White Water Rafting. I think the differences between Tenkara and western fly fishing get overly exaggerated. I am also new to the sport, and have played around with both set ups, and I can’t find any substantive differences when it comes to ease of use, cost, or even weight. 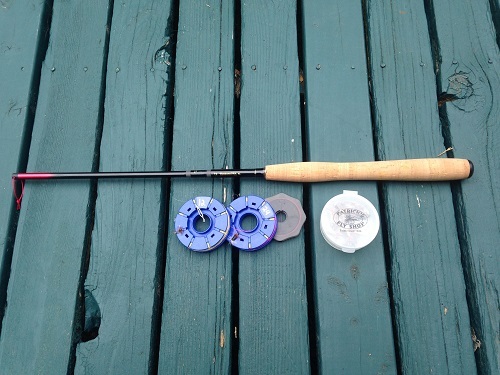 I have a basic western fly rod (9ft 5wt), and can set it up in about two minutes. It is as easy to cast as a Tenkara rod. If you just leave out a fixed length of line, you are pretty much dealing with the same set up. You can do fancier things with the western fly rod, but you don’t have to. Similarly, you can carry a lot of gear for a western set up, but you don’t have to. The same way you can Tenkara fish with a single fly, you can do the same with a western fly rod. The fish has no idea whether the fly is attached to a rod made in Japan or Maine. I also found the prices to be about the same. I paid for my full set up (rod, reel, and line) the same that it would have cost me for a similar Tenkara set up. You do have some added weight with a western fly fishing set up because of the reel (about 3 to 4 oz). However, that’s pretty much it. For me it’s six of one, half dozen of the other. I think there is a perception that Tenkara is simpler, lighter, and more basic, but I don’t see the big differences. The final set up no matter which way one decides to go largely depends on the angler. Each set up can be made as simple or as complex as one wants. All good points – thanks Ross! Western doesn’t need all that gear either. I fish both Tenkara and Western Fly and love them both. But one thing that Tenkara taught me was how little you really need to be effective. My Western gear went from a small backpack and lanyard down one single 9x4x6″ fanny pack.